There is a certain dramatic tension in this painting, The letter, executed in 1994. 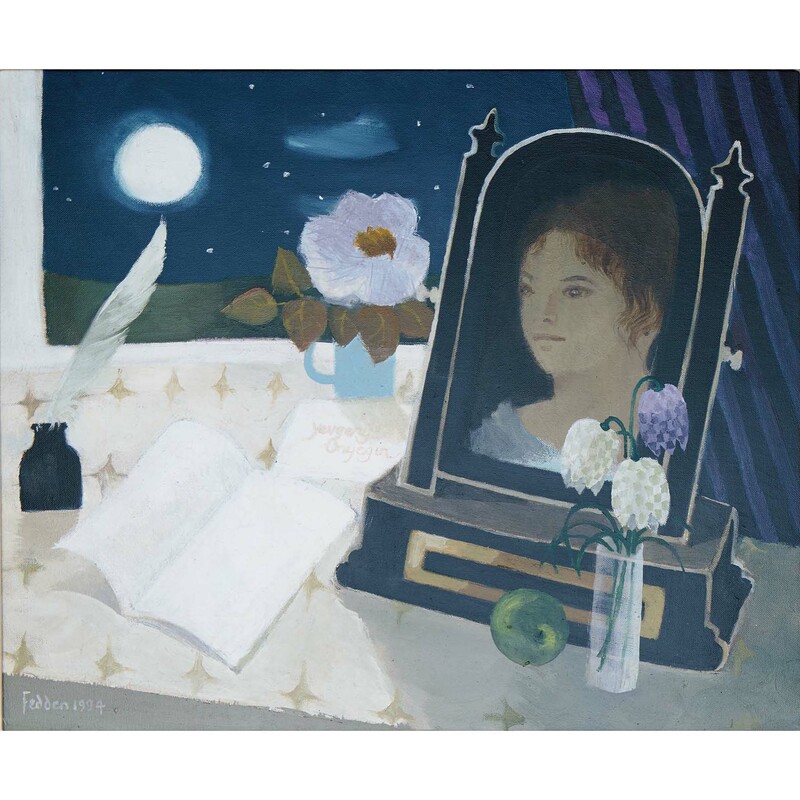 This work combines elements of Mary Fedden’s preferred genre, still life, with the suggestion of a moonlit landscape beyond the open window, and the inclusion of a female figure, seen somewhat mysteriously reflected in a mirror, pouring over a freshly written letter. While studying at the Slade, Mary Fedden was most affected by her tutor Vladimir Polunin, a theatre designer who had worked with the Ballets Russes, and the billowing curtain which often reappears in her paintings is a testimony to the influence which he proved to be on Fedden, who indeed designed sets for performances at Sadler’s Wells before opting to dedicate herself to easel painting. The curtain not only neatly frames the composition, but also lends an element of theatricality. 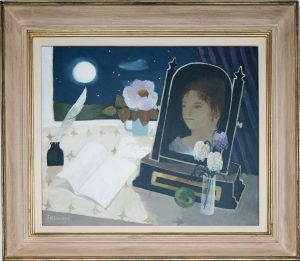 Alas for Tatiana, her love is scorned until it is too late, yet Mary Fedden clearly captures the anguish which drives Tatiana to confession, and the hope which fills the moment of the letter’s composition, translating onto canvas the magical beauty of Tchaikovsky’s score. MARY FEDDEN. THE LETTER. Available for sale – please contact us for further details.